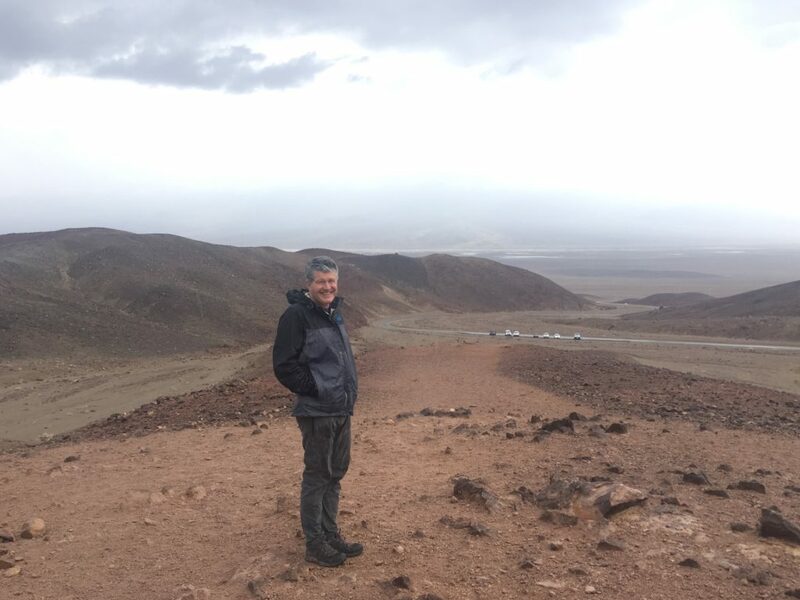 Outside, rain was falling on the driest and hottest National Park in the United States. When we told the ranger at the visitor’s center we were from Seattle, she blamed us. Yeah, we’re used to it. 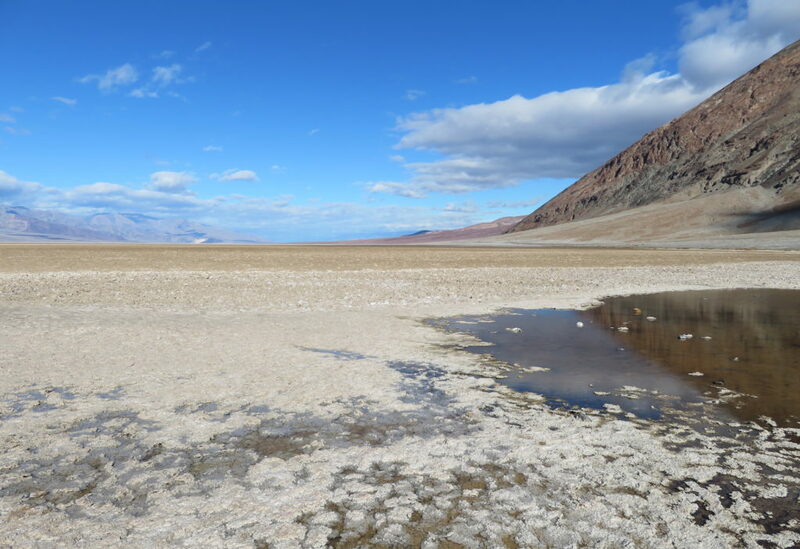 When I was growing up, Death Valley was this mythical place that I knew primarily through the long-running television series, Death Valley Days—which was hosted for a year by Ronald Reagan before he became Governor of California. 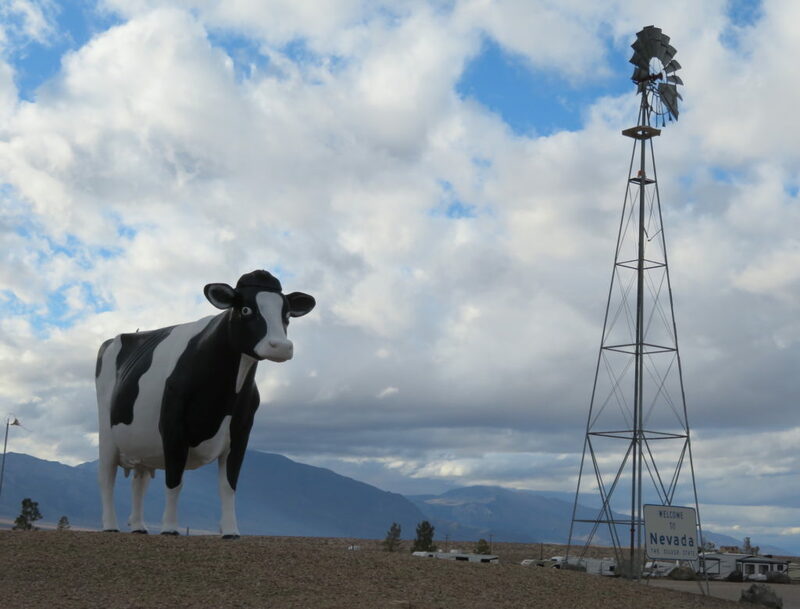 The series featured true stories of the old American West, many centered around Death Valley. * It was usually portrayed as hot, dry, and unforgiving. 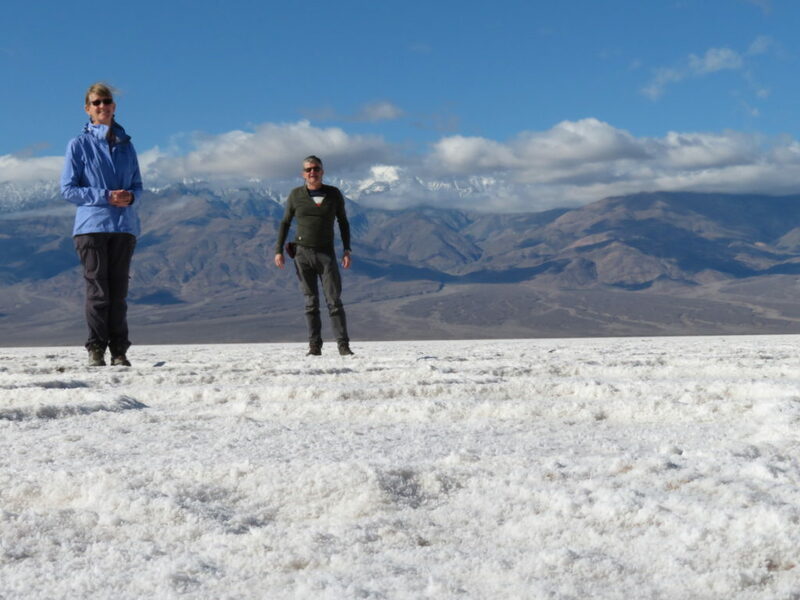 This was our first visit to Death Valley, and during the three days we spent there, it was a far cry from being the driest and hottest place in the United States. But we did manage to enjoy a few activities in the park. 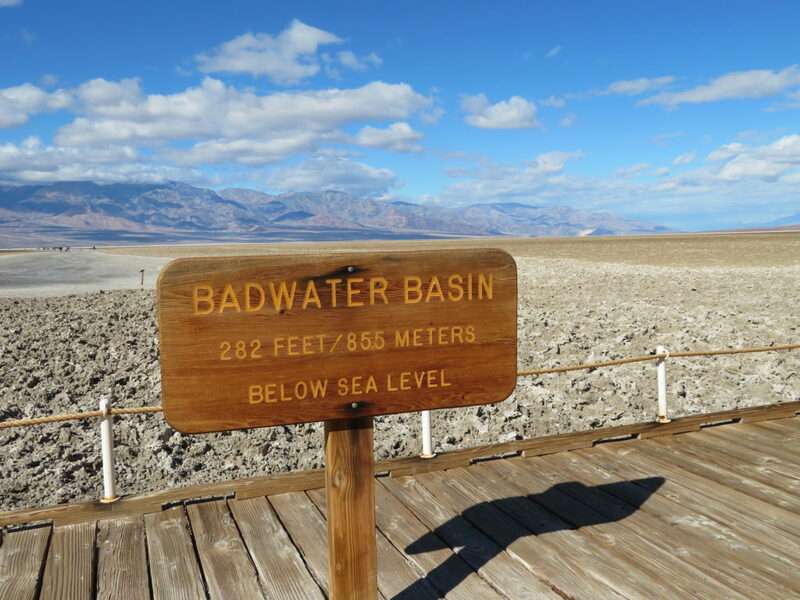 Badwater Basin is the lowest point in North America—282 feet below sea level. 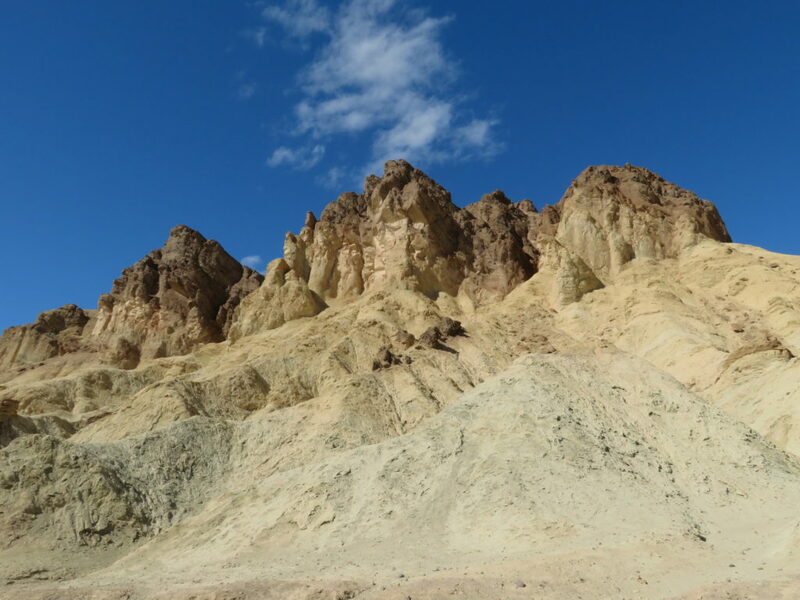 Death Valley was formed millions of years ago when the land dropped down between two faults. Over eons a lake formed, then the valley filled with silt. In modern times the basin is dry—but periodic flooding will create a shallow lake. 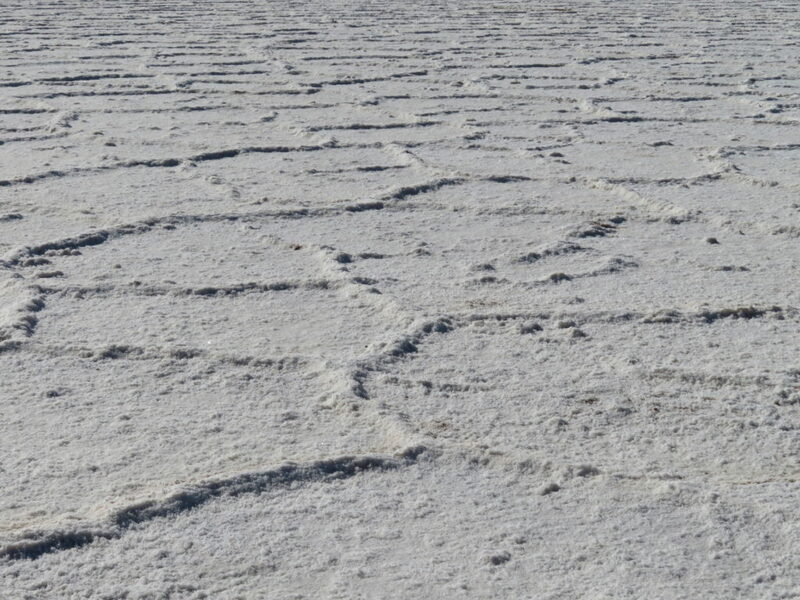 When we were there, we walked out onto the salt flats left behind when the ancient lake dried up. They taste…salty. Hiking. 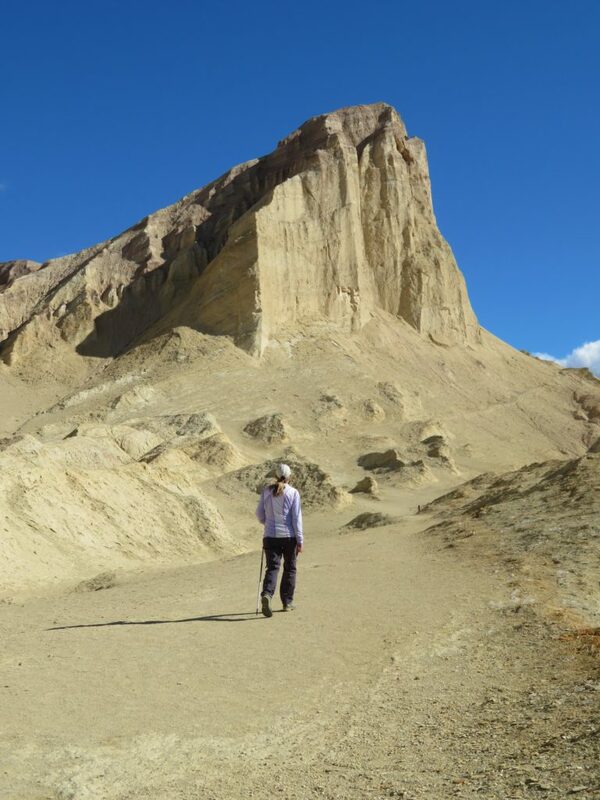 There are many hikes in the park. We did an easy one to the Natural Bridge—just one mile out and back. We also did a 4.3-mile loop going through Golden Canyon and Gower Gulch. Both segments used to be roads. There are a few sections of pavement left behind by flooding over the years. The high point of the trail skirts a high rock spire, Manly Beacon. A short trail off this high point leads to a great view of the valley and a nice place to stop for lunch or a break. I learned later that parts of this hike were featured in two Star Wars movies. Think–Tatooine. 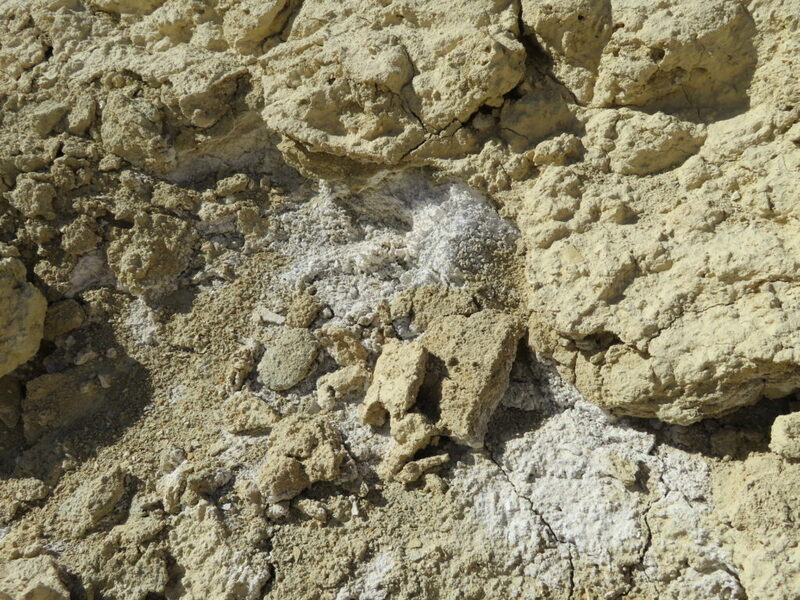 In several locations we saw a white powder that could be borax—a mineral used as a detergent booster. 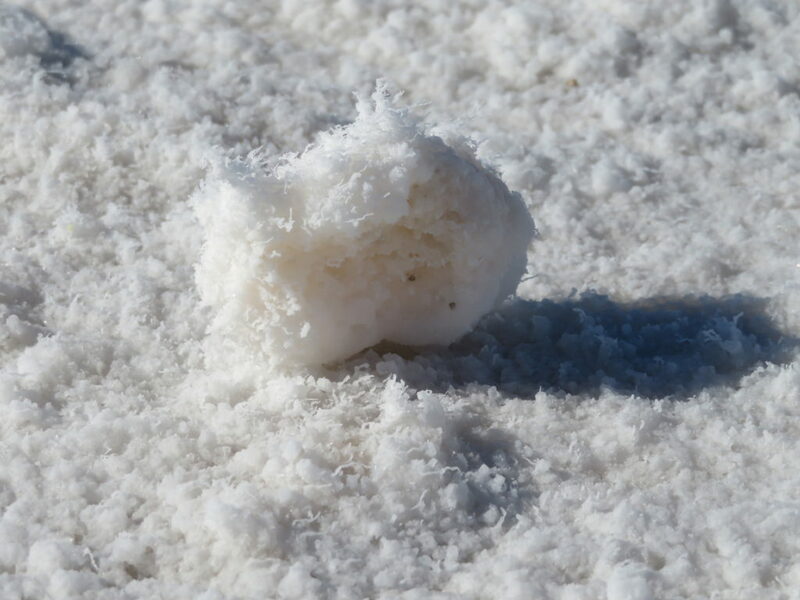 Borax was once mined in Death Valley and 20 Mule Team Borax was a sponsor of the television series of the same name. 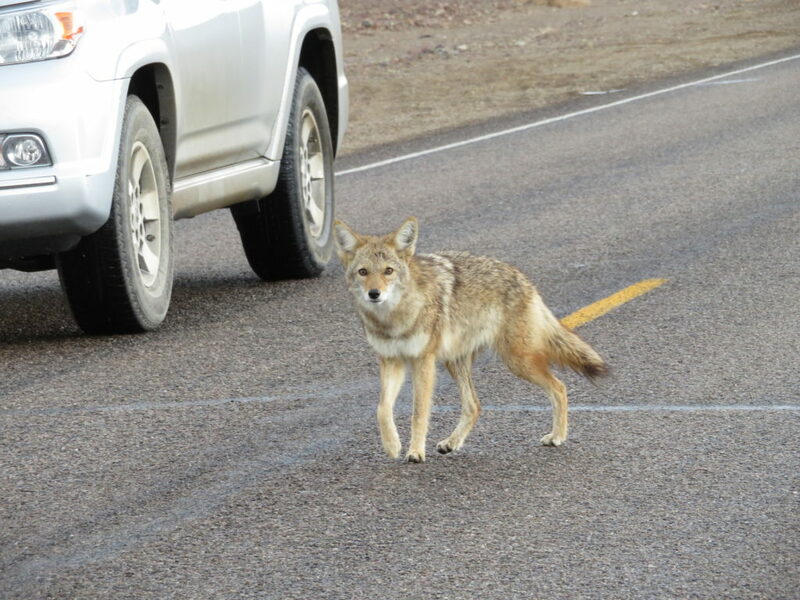 Teasing a Coyote. Not really. We did stop to take a picture of one that was begging for food, but didn’t feed him in exchange for the picture. It’s forbidden. I suggested he go find a kangaroo rat and we drove off before he got nasty. Because of the weather and our short stay, this turned out to be just a brief glimpse of the largest park in the US National Park System. 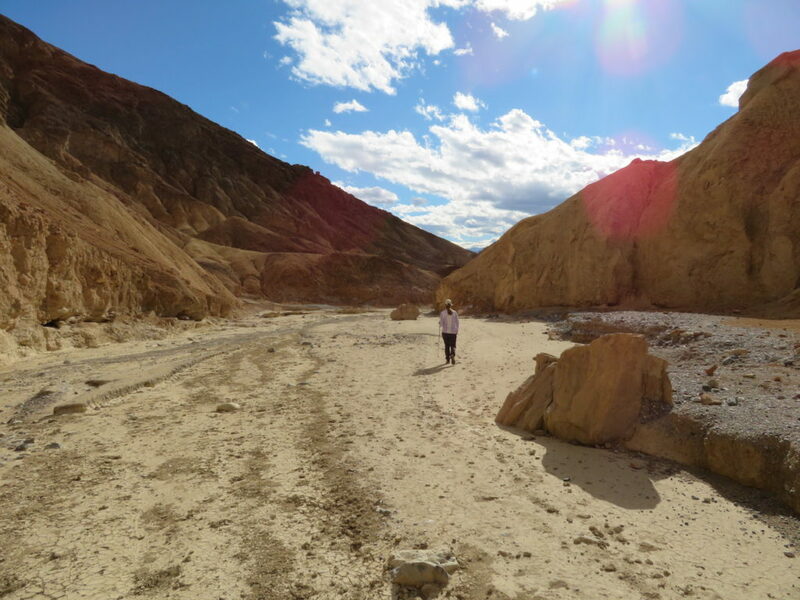 I’d love to return—maybe after watching a few old episodes of Death Valley Days. Episode’s hosted by the Gipper, of course. *Death Valley Days ran on television from 1952-1975. Yes, I know that dates me. We in the Seattle, Tacoma and all of the Great NW has experienced a snow STORM! (continued) these here new-fangled devices seem to Send when I had not hit Send! We were warned a whole week ago Sunday that we would have 3 to 8 inches of snow this weekend, and it would start on Friday at noon. (We already had 2 inches on Monday the 4th.) The snow did begin in Tacoma and the valley at 11:00 a.m. and after it all had stopped sometime during the night the total was 8 inches! We also have prospects for more snow soon this week. Most everything scheduled gets cancelled. So glad you c’d @ least touch Death Valley —the boys LOVED it! Ck Sam’s post of the doggies playing in Bellevue snow. They do need periodic rain here–just funny that it happened while WE were there.